Not being an engineer, one might think that the documentation of a borehole construction is not interesting to accompany. However, if this construction takes place in an area hardly visited by non- South Sudanese, such a documentation can become the most unique, inspiring and thought-provoking experience. A once-in-a-lifetime chance. It could not have been any more spontaneous as I booked my flight to Juba less than 24 hours before shutting the housedoor. Once in Juba, the heat hit me. Crossing the taxiway, I hurried to some pavilions that hardly resembled a terminal of an international airport. I quickly learned that the South Sudanese airport is still under construction, so security checks and visa registration just take place in these pavilions, open on all four sides. I had hardly stepped into one of the tents, when policemen were already gathering around me, all carrying enormous guns. Being a bit scared when I was just confiscated my passport, I recognized a few seconds later that one of the men actually had my entry permit in his hands. As a European women, I was only allowed to board the flight to Juba from Entebbe because of this “holy”, and actually very expensive sheet. Getting this permit is the opposite of easy. It cost Majom, who is working for the South Sudanese Defence Ministry many hours and convincing arguments. Once I had passed the security checks I faced a huge smile – Donald, a Ugandan guide who would become my travel mate for the next nine days, took me straight to the hotel. Surprised by the village-like character of South Sudan’s capital, I learned that quite many of the little businesses are owned by non-South Sudanese. Walking down the streets, trying to find some local food, I was further surprised by the few restaurants that existed. After sunset the streets were almost pitch-black – there was hardly any other white skin-coloured person due to curfews that most companies and NGOs impose on their employees. 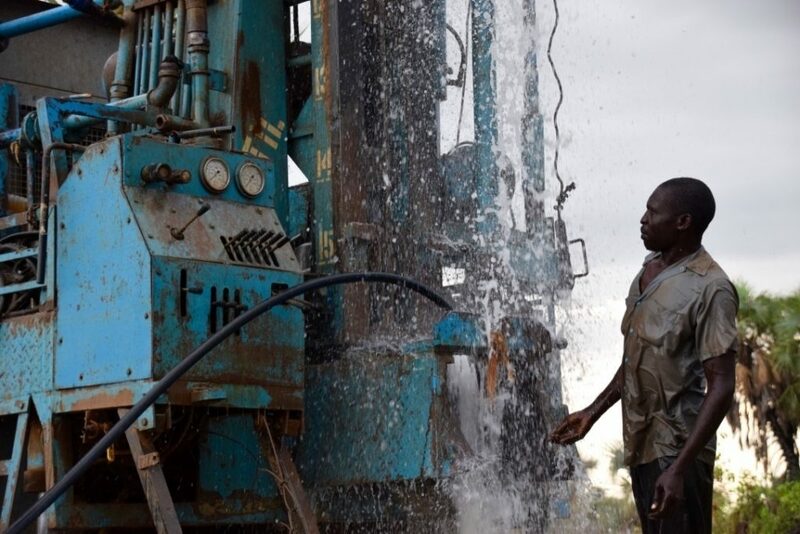 As the borehole company’s trucks were not in Juba yet when I arrived, we had to wait another day before heading to the Mundari village Nyica Bor – a place that cannot be found on Google Maps. So, together with Henry we went to a small market and bought lots of food we aimed to cook while staying in that remote area. The market was small and smelly. When entering, Ugandans were selling their products on the left-hand side, South Sudanese on the right-hand side. I was seriously startled by the food prices that seemed to be higher than German ones. The next morning, I was excited and somehow scared, knowing that we had to cross three check points before arriving at our destination. Arriving at the Indian company’s compound early in the morning, the atmosphere was hectic as trucks were loaded with sleeping mats, food, and lots of construction material. Leaving around noon, we reached Terekeka, the last place with electric power and network, after sunset. Tired but happy we made it, we reached the village Nyica Bor at around 9 p.m., meaning that on average we had needed one hour for around 10km due to uncountable potholes and long negotiations at the checkpoints quarrelling about the bribe. After being welcomed by a couple of the village’s leaders, we put up our tents and washed ourselves with one jerrycan- two litres per person. Next morning, awakened by the sunrise, I saw the small round huts made out of clay and grass, I had not recognized the other night. With Frederic, a local aged 23 who is schooling in Juba, I had my first interesting conversations while walking through the dry landscape. The sand on the rather open dry Savanna was already warm, bushes, trees and different palms crossed our way. From time to time, we passed a hand full of huts – where we were heartily greeted. As Frederic is a Mundari himself, he took over the talking part. Both adults and kids stared at me, touched my skin, my hair and when greeting, they hardly wanted to let my hand slide out of theirs. It seemed a miracle for them how one could have red blood under white skin, so I was frequently asked what colour my blood had. Meanwhile, I was impressed by the locals firm smile and strong posture. Hardly wearing any clothes, except for a huge and colourful scarf and some bra or shorts, their walk was unique for its proud and straight movements – to me it was somehow majestic. We moved further, watching how the Mundari were performing their morning tasks. While Frederic and I spent the morning in the village, the borehole company’s workers inspected the construction site and checked possible watering holes. 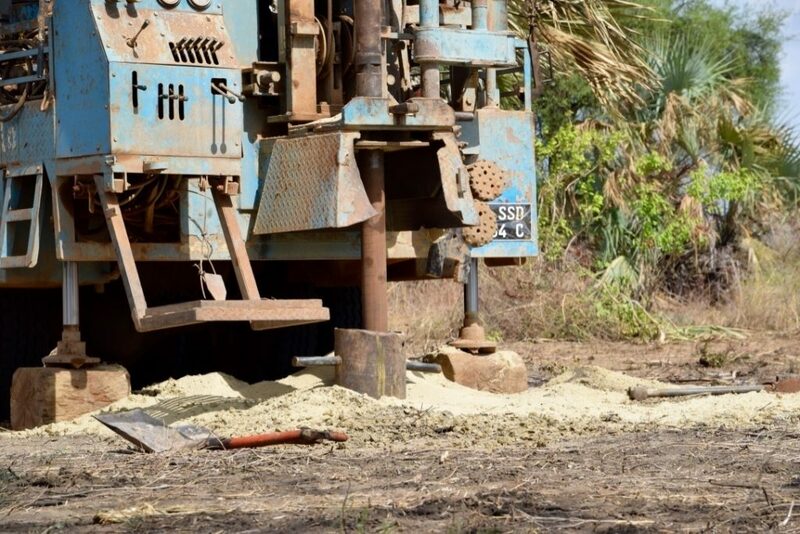 At noon, one of the two old “Ashoka” borehole trucks made his way to the construction site – it was a massive truck for Nyica Bor as the village has no streets. Usually, there is no car nor any bigger vehicle passing the village at all. A bus system which would connect the village to any other village or town does not exist. Still, the truck passed the church (Christian missionaries had actually converted some Mundari), to the point where the hole would be drilled. My very first and my last walks for the next couple of days were defined: checking the borehole’s place. Once the truck was parked, the elderly of the village came, holding a stick to support their old bodies and a kind of wooden rolled ‘sitting bank’. Surrounded by a few naked boys, they sat down and started to exchange, discuss and finally pray for the longevity of the water pump. During the prayer, Martin, a Mundari himself, who had worked with the German Institute for International Cooperation (GIZ) in 2006, read out some parts of an old bible. On a different day he told me that only around 5% of the Mundari are actually able to read and write, meaning that he is one of the very few in that village. With two other men he built up a small community school to teach young children some basics in English and Mathematics. There is no building, no books – students come and sit in the shadow of a big tree. As nobody is paying, neither the state, nor the community nor the parents, teachers come on a voluntary basis and teach only till noon as there is no school lunch provided. Back to the construction side: once the heavy machine was set up and the prayer of the elderly was finished, a goat was sacrificed, exactly at the place where the water would bubble out a few days later. Only a few moments later, heavy black dust came out of the engine while the drilling pipe was pressed into the hard soil. It was a noisy and comparable short endeavour. This noisiness was something very unusual, as many of the villagers had never seen such a truck and such a loud and smelly machine that drilled a hole of 60 meters within minutes. While documenting the different steps of the process, kids would suddenly appear in front of the camera’s lens. Even though they had been a little sceptical at the first day, they quickly started to love seeing themselves in this strange black box. Not having any mirrors or natural mirrors such as lakes, many had never seen themselves before. For days, we just spent time taking photos, laughing, playing merry-go-round and, of course, climbing trees. Whenever the heat was nearly unbearable, we climbed up, imagining a colder breath of air. To tap the water a 2.5m*2.5m hole was dug and then filled with water – for pressure compensation. With sickles both men of the company and villagers dug from sunrise to sunset, quarrelling with the stony soil. It was incredible how much manpower was needed to dig this rather small square. 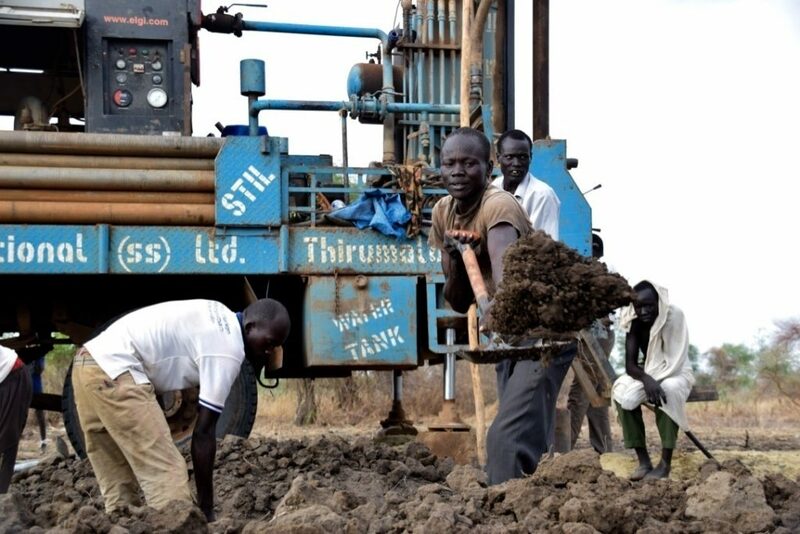 Once the hole was almost excavated, I went with Donald, Martin and Frederic to Terekeka in order to negotiate with the two owners of the water tank trucks operating in the area, which we would need on the next day. Looking like petrol trucks, these trucks are of pivotal importance not only in the rural areas but also in the country’s capital. As there is no water pipeline system, restaurants and hotels are supplied on a daily basis with fresh water. When going to Terekeka, we always took the chargers of our cameras and mobile phones with us. However, electricity was not always on, meaning that often we just left our batteries there and came back the next day, hoping that there would be power for a few hours in between. In general, power was normally on from 3 – 6 p.m. The journey to and from Terekeka was always an adventure as we travelled with around 8 – 10 people in our Land Rover, finding our way through the bush. But apart from our way between Terkeka to Nyica Bor, the journey to the cattle camp was even more spectacular as there was no indication at all where to go to. While children, women and elderly mainly inhabit the village; men, grown-up boys and a few women oversee the cattle camp. Without the villagers themselves we would not have found the way, even though Donald had been in that area quite a few times. The cattle camp is an almost indescribable place. 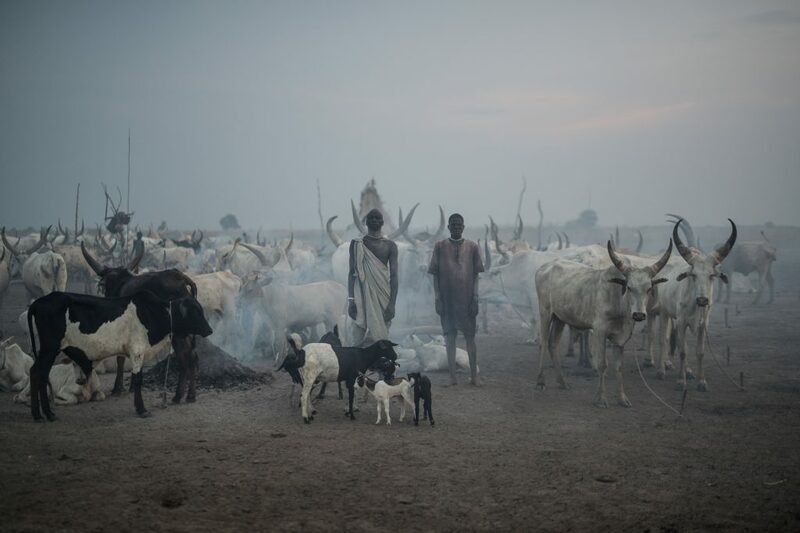 It is a place where a beautiful scenery meets the smell of cows and burned cow dung, the drumming and singing of beautiful male voices within an opaque view due to the many small fires. Inbetween straw huts and the many majestic cows and bulls with immense horns that are beautifully curved, tall Mundari men move throughout the camp. Once in a while they stand still, watch out, chuck the cattle’s back and move on. This camp secures the village’s existence. 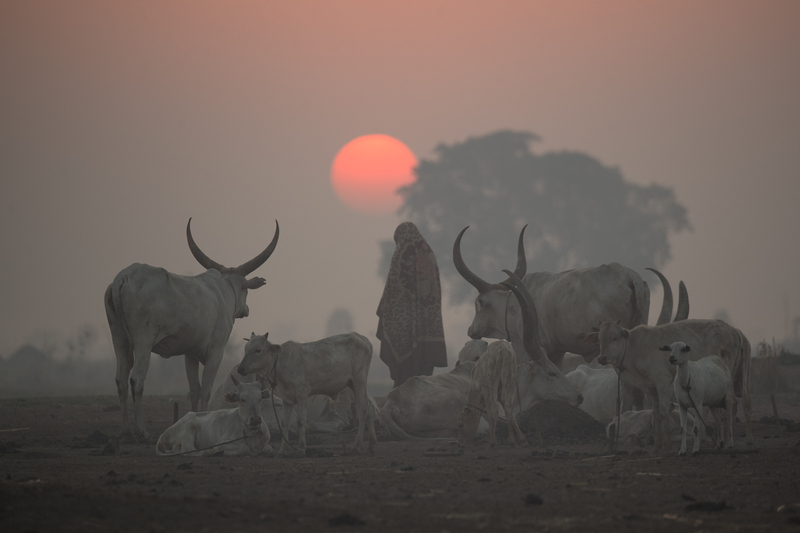 Traditional Mundari live with and from cows – cattle are their currency. Hence, wealth is dependent on the number of cows. When a couple wants to get married, the wife’s parents are paid in cows dependent on mainly physical strength and phenotypical characteristics. The night camp at the river is a magic place; it is a place where different impressions are merged into a wonderful whole. With sunrise, the mooing of animals is getting more intense and thus more men will get up. Children will collect dung while the older family members clean the cows with sand and water. Suddenly, some of the boys might jump into the water, come out and apply lots of burned ashes on their wet bodies – as a natural mosquito protection shield. Once coloured in grey ash they might however clean their faces once again – now with the pee of the cows as this is natural disinfection for their skin. Then, when the cows have been cleaned and cow dung has been collected, they go somewhere for grazing. In the late afternoon they’d come back to the river side for the next night. Coming back from either Terekeka or the cattle camp, we always checked the busy construction site, talking, helping and documenting. Sleeping up in a roof tent was a very advantageous thing, as neither scorpions could bite us nor a mosquito net was necessary, meaning that fresh air was all around us. Awakened by the sun and colorful skies, we started our day that soon would become very hot and extremely dry. After such a night, the guys from Thirumala asked me to join them at the construction site – a little drowsy, I took my camera and went with the men that were still yawning as well. Reddy, the boss, grinned and started the heavy engine that soon destroyed the silence. After some seconds the first water came out of the borehole! It was fresh and tasted good and clean. It was an amazing feeling watching the water bubbling out! It was a party! We started singing, laughing and dancing under the water until the pump was entirely working. The whole day was particular in so many ways. Women came to join the construction site and so we took lots of pictures, children were pumping their first water with a hand pump out of steel, heavily smiling. Once the pump was installed, the foundation out of cement, gravel, sand and water was built and the rest of the construction site was cleaned up. In the evening, goat meat was eaten by all those who helped, since the village decided to sacrifice a second goat when they saw the project already at an end. But the water did not only come from below that day but also from above! After a very long dry season, the very first rain pattered on the hard, sun-burned soil, accompanied by strong wind. Suddenly it got almost cold so that we went into a hut with a palm tree roof that protected us. Inside that room, we had once again amazing talks and compared family customs. On my sixth day in Nyica Bor, I had to say goodbye as my flight was booked, going to Uganda to work on other projects. We had a great time. A time that changed my philosophy, my outlook on life – I learned what confidentiality really means. Travelling to a place in a country that is haunted by war and knowing that more than half of the country’s females are raped at least once in their lives, means to trust and to believe in persons’ morality – especially if travelling alone as a white women. Kirsten is a student in international relations at ETH Zurich. She has been CEO of a bilateral organization working in Germany and in Uganda for 5 years already. Living according to her personal outlook on life #becauseweareoneworld, she loves projects that enhance the quality of life of people living both in her home country or somewhere else on this beautiful planet. She fights for better conditions for economically less privileged – therefore, spending much of her time either working for social and cultural projects or for ecological ones.